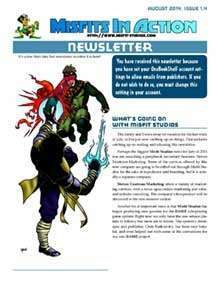 The monthly newsletters by Misfit Studiospresent news regarding what is going on with the company, recaps the products it released during the previous month, and offers a free product promotion. Details on a new venture, Steven Trustrum Marketing, and Misfit Studios' foray into offering BASH! products. Release details on Operation Marshal Law for BASH!, Eric Lofgren Presents Battle against the Undead, Eric Lofgren Presents Attack, My Minion!, and Website Analysis Report. This newsletter’s promotion was giving away free copies of a Misfit Studios Savage Worlds product of your choice. This promotion still has 9 out of 10 free copies available to give away, so look inside the newsletter to find out how to win.